QuickWave enables analysis of microwave heating problems by coupling electromagnetic simulation performed with QuickWave 3D with heating module QW-BHM. 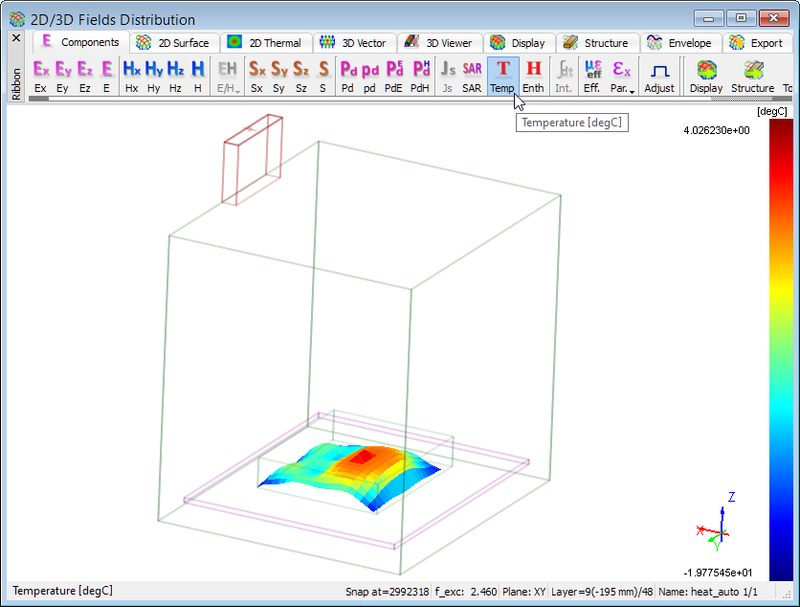 For microwave heating simulations, QuickWave delivers the information about the temperature (in [oC]) and enthalpy density (in [J/cm3]) in the heated objects. QuickWave delivers the values of maximum (Max temp.) and minimum (Min temp.) 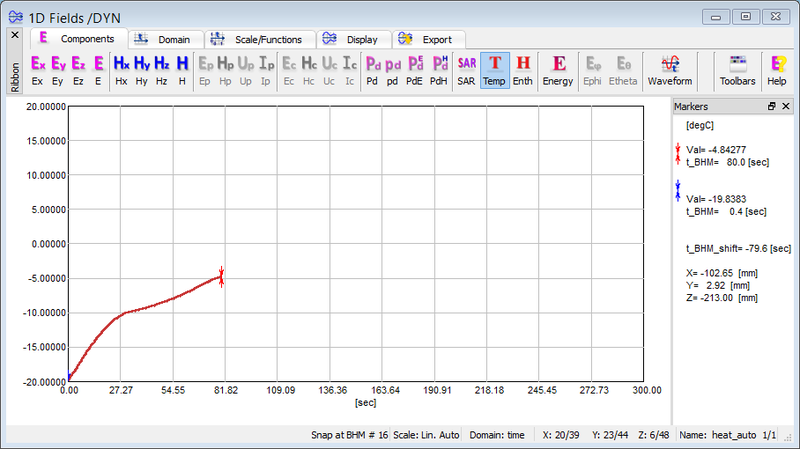 temperatures detected in the analysed circuit after completing BHM step. Those values are available in the Simulator Log window for each completed BHM step. 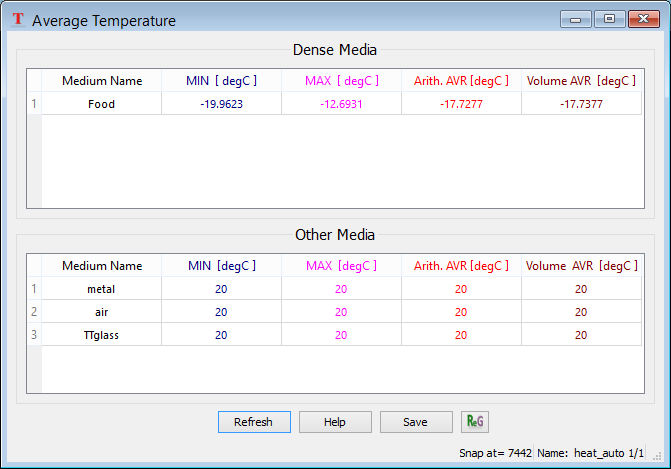 The information about the temperatures values is supplemented with the coordinates (given as cell indexes and as absolute position in mm) of the cells in which the maximum and minimum temperature values were detected. QuickWave allows for monitoring the variation of the temperature and enthalpy density in time at a particular point of the circuit. This option is available in the 1D Fields window. It should be noted that the temperature and enthalpy density are displayed versus heating time, and not versus the electromagnetic (FDTD) time like other electromagnetic components available for time domain monitoring in 1D Fields window. The history of temperature or enthalpy density variations can be saved to file. QuickWave delivers 2D distribution of the temperature and enthalpy density in the heated objects, which is available for every FDTD layer along each of three axes. The distribution is available (and automatically saved to *.vi3 file) for each BHM heating step. 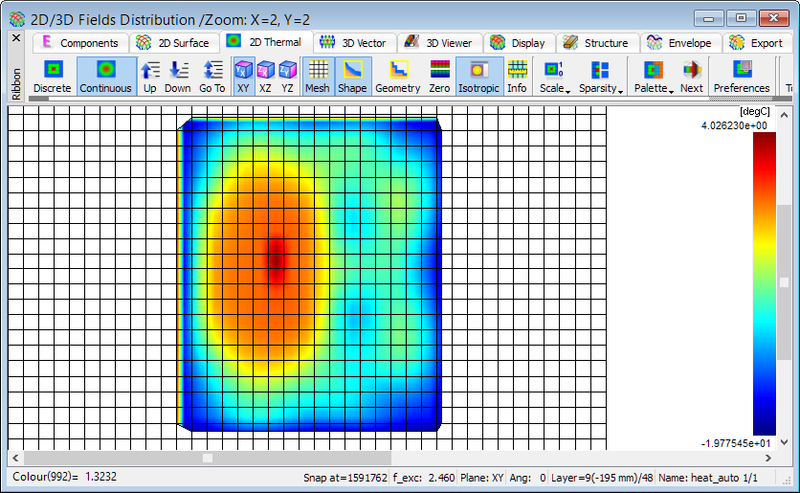 The 2D temperature and enthalpy density displays are available in the 2D/3D Fields Distribution window. 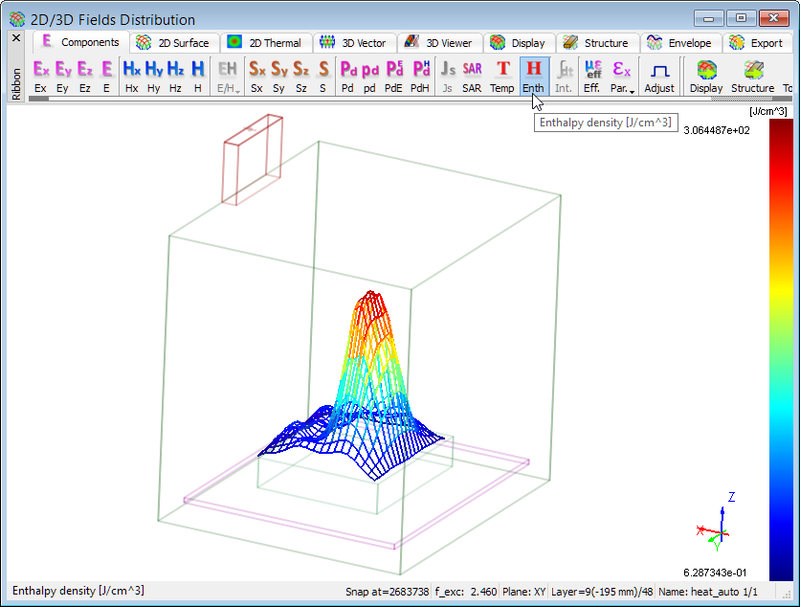 QuickWave offers also the Viewer 3D display of temperature and enthalpy density distributions. 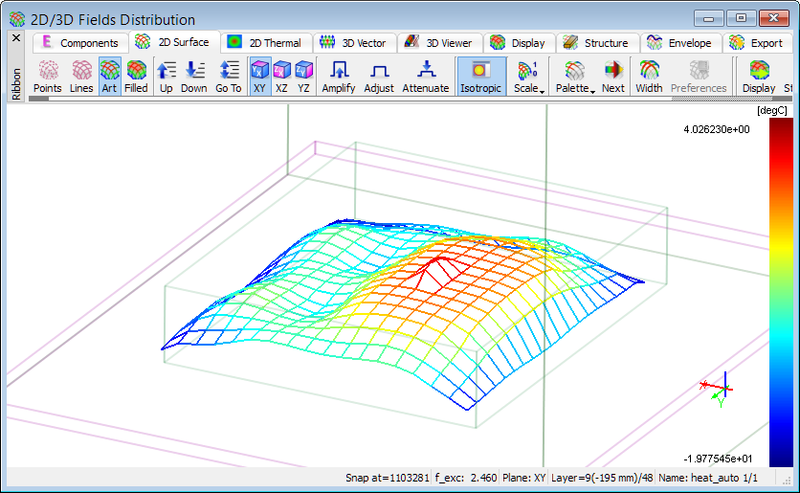 This feature is enabled in the 2D/3D Fields Distribution window. The application of the above functionalities and options is widely discussed in online documentation of QW-BHM module. QuickWave delivers a value of average temperature calculated separately for all media (lossy and lossless) included in the project. 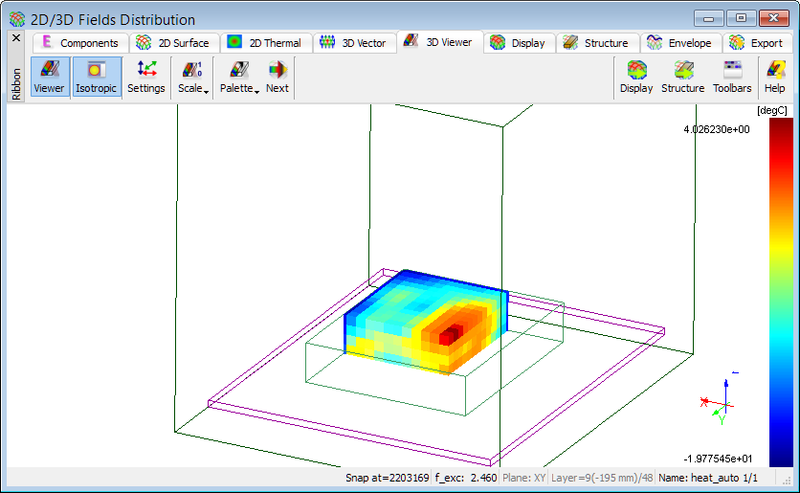 This feature is available for microwave heating simulations performed with the use of QW-3D and QW-BHM. The value of average temperature can be viewed in Average Temperature window. The average temperature is calculated separately for each medium included in the simulation project. The Average Temperature window shows separately the list of media with non-zero density (both lossy and lossless) and those with zero density (both lossy and lossless). See also online documentation about average temperature.